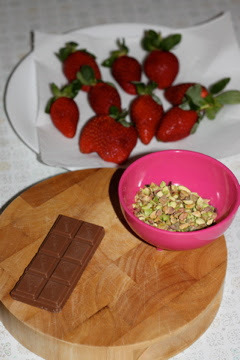 whitebrickwall: Strawberries, Chocolate and Pistachios...Oh My! It's been a while! It's well over a week since my last blog, and boy have I been missing it. It's not just my blog that has been temporarily abandoned... My garden has been neglected +++, and is in desperate need of a good weeding. Some of the nasty weeds are standing taller than the small trees. Lady Mausey would be disappointed in my weeding efforts, but most of the actual plants seem to be doing well. They are loved and watered. I've just been lazy on the weeding front. Whilst I am yet to have myself a fully-formed strawberry - the plants just keep growing more flowers and more buds. Every leaf I lift up, is hiding more little strawberry babies underneath. Strawberries must be in season at the moment. Obviously mine are growing, but at the shops they are big, juicy, delicious and cheap. So Adam bought three punnets. Perhaps my bulk buying addiction has been passed on to him? I will have to keep an eye on him.... I have been slowly working my way through the strawberry supply. I love a couple cut up on my rice bubbles in the morning. Still, three punnets worth of strawberries is a lot, and I put in a good effort, but with one punnet left, I decided it was time to utilise them in another way. Yesterday, whilst exploring the realms of Pinterest I found and pinned a super simple and scrumptious looking strawberry dessert... Only 3 ingredients required. 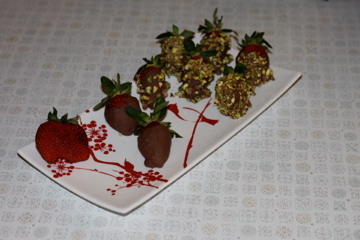 Strawberries, Chocolate and Pistachios...Oh My! 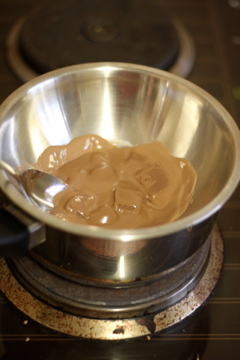 I have never melted chocolate before. So I decided to make sure I was really organised before I started my first attempt. I prepared all my ingredients. Washed and dried my strawberries, shelled and chopped my pistachios. Armed with only the knowledge of someone who watches Masterchef, I heated some water in a small saucepan on the stove. I put the bowl inside the saucepan, and popped a few rows of Cadbury cooking chocolate and lo and behold... it melted!! I'm obsessed with Dark Chocolate at the moment, so I don't know why I picked the milk chocolate... but it was just what I was drawn to at the time. 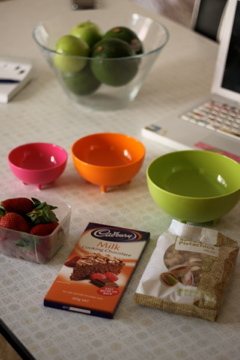 I will have to try it again some time as I think the salty-ness of the pistachios will go well with dark chocolate. I deduced this from the simple fact, that Lindt Dark Chocolate with Sea Salt is my most favourite chocolate of all time. Chloe put me on to it, and I have been obsessed with it ever since. 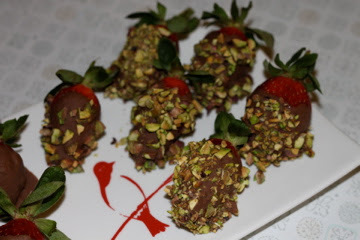 I dipped the strawberries in the melted milk chocolate and rolled them in the chopped pistachios and popped them on baking paper (so they don't stick to the plate). Then I put them in the fridge to set. They are not as pretty as the ones I saw here on Pinterest. Though, not bad for a first try. Surely second time around I will cover them with more finesse. I served them out after dinner as a light dessert.... and they were super delish. So easy, and yummy to boot. I highly recommend them. Nick and Adam were busy researching and creating their Warhammer army, but broke away to try my little creations. It wasn't just me, they loved them too! Sweet Dreams. See You Tomorrow!